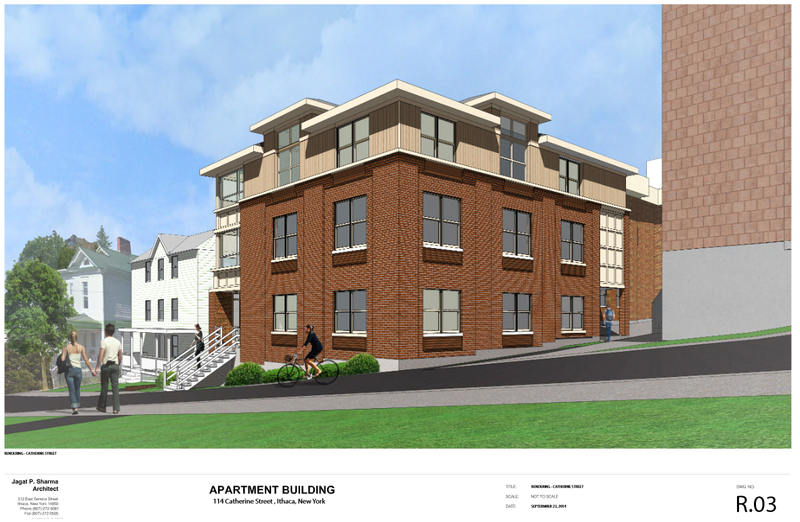 Yet another project slated for Collegetown and its construction boom. 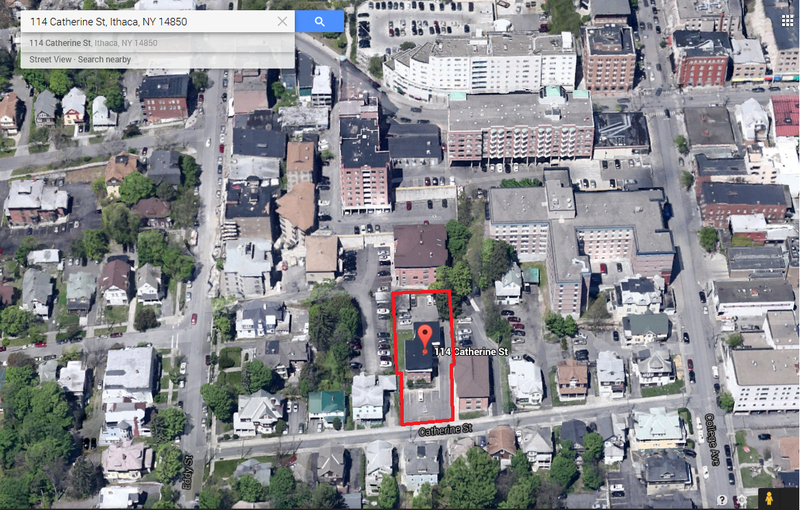 In this case, it’s 114 Catherine Street. 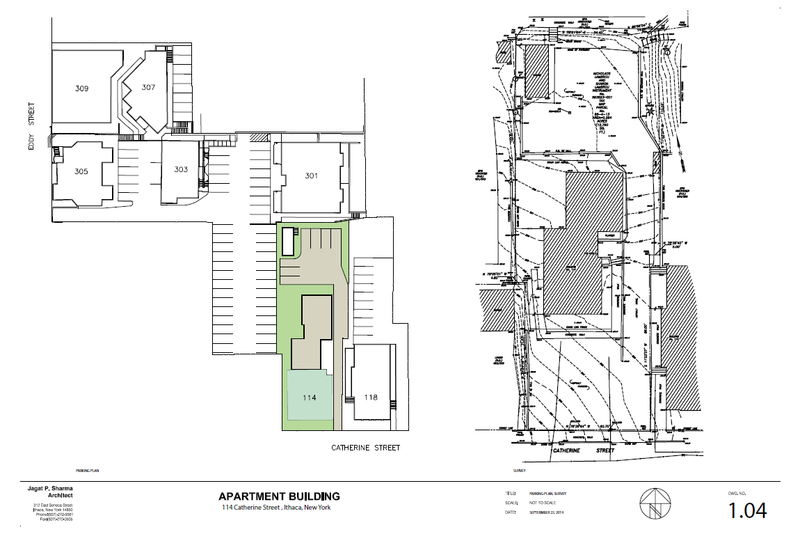 I discussed the background of the parcel in my last post, but I’ll do a one-sentence rehash – it’s a 10-bedroom apartment building in a CR-4 zone where parking isn’t required. Now we have a design. Renders and sketch plan details here. Perhaps somewhat surprising, the new building doesn’t tear down the whole apartment building and take advantage of the full lot. 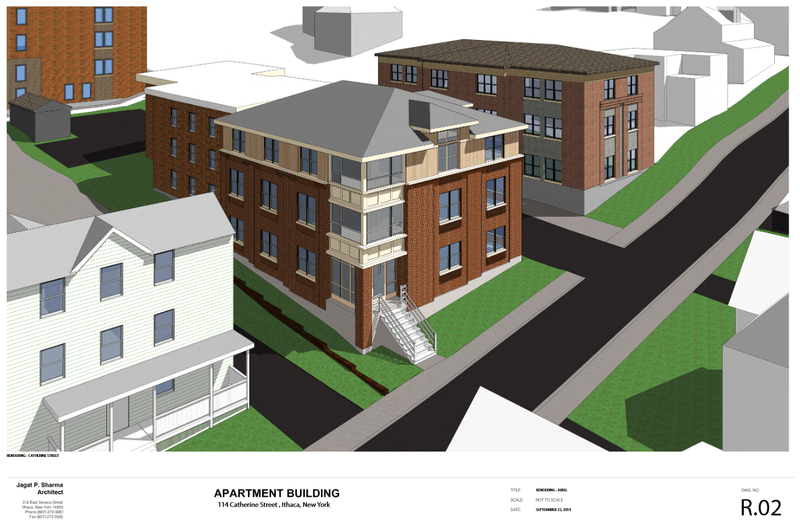 the new 3-story, 4,180 sq ft, 17-bedroom addition will be placed in the front of the current building, replacing the street-abutting parking lot (hooray for that). There is one 5-bedroom unit on the first floor and a 6-bedroom unit on the second floor and the third floor. The design is by the prolific Collegetown firm Sharma Architecture. If they wanted to, they could probably add another floor, but in terms of length and width, this is pretty much it once you account for required lot setbacks and maximum permitted lot coverage. Is the design going to win awards? Probably not. It’s not bad, though, and it’s certainly better than a parking lot. Since CR-4 doesn’t require parking, this parcel will lose 6 spaces of the current 14, and have only 8 spaces on the property. The old zoning would’ve required 18 parking spaces. Extra spaces would be available for rent in the parking lot northwest of the new building, on an adjacent parcel also owned by developer Lambrou Real Estate. For what? Collegetown long ago stopped being a suburbany community. That strip of grass is just going to wind up being another place for undergrads to play beer pong, like every other level surface in the neighborhood that’s not a traffic lane. Wish the developer could’ve gone for maximum buildout of the lot to reduce rents as much as possible. I was surprised that the Lambrous aren’t even coming close to max buildout with this design. I played with some mental math earlier, and they could double the size of the proposed addition and still be comfortably within zoning. As for the green strip, the intent is well-meaning, it’s the densest of the transition zones before the mixed use categories (MU-1 and MU-2).